SO/ Sofitel Singapore is a luxury hotel ideally located in the city-state's central business district, fusing old-world charm with the latest technology. 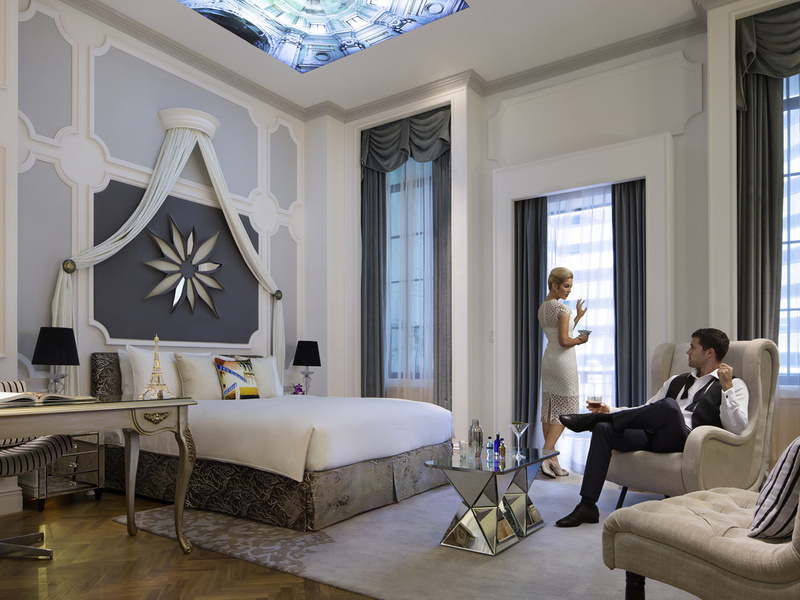 Housed within an iconic former telecommunications building and decorated with a perfect blend of both French style and chic Singaporean influences, it redefines the luxury hotel experience in the Lion City, and is perfect for any traveller who wishes to experience local charm at its best. Within walking distance to Chinatown, Marina Bay Sands, and Orchard Road, for business or leisure travellers, SO/ Sofitel Singapore will be the ideal choice of accomodation. SO/ Sofitel Singapore is also well connected by the subway. Beautifully appointed room in an amazing location with really welcoming staff. We felt important and heard during our entire stay. Staff were friendly and helpful. Nothing was too much trouble. I reserved the hotel through the corporate travel agency (BCD), but there was no reservation record at the hotel when I checked in, so I had to find from email and provide my reservation detail to the reception. Neither the accommodation not the service is to a 5 star standard. The overall experience at this property is bordering on a 3 star standard or low end 4 star. From the check in experience who didn't want to upgrade me even though I am a Platinum level Fairmont member to the server at the pool who told me I had to call downstairs if I wanted to order another drink, I was very unimpressed. I felt very welcome from the moment I arrived and nothing was too much trouble for any of the staff. The rooms are well appointed and I loved the inclusive minibar! My son and I enjoyed an amazing stay at So Sofitel Singapore. We were delighted to receive an upgrade. Attention to detail and customer service were exemplary. We did not eat at the restaurant, and this cannot comment on food quality. Comfortable, exceptional experience, felt welcomed by all staff at all levels including Xperience restaurant, concierge, reception, housekeeping. Magnificent rooms. luxury at an affordable, fair price. even though this is business trip, I will return with my wife and family when we come to Singapore on vacation from Sydney Australia. Very pleasant stay in a boutique style hotel. We did find the standard room inadequate with two large suitcase and accordingly upgraded to larger room to allow more room to access cases. Breakfast was great each morning however Barista coffee took too long an every occasion. The very friendly concierge staff were a highlight. Good location, near to MRT, one stop to Chinatown and easy to other destinations as well. The staff are very welcoming, always welling to help and the Urban room with twin beds is OK but the bed is very comfortable . The Lau Pa Sat hawker centre is just across the street & in the evenings, a small section of this street, adjacent to the hawker centre is closed off, out comes the tables & chairs (on the closed road itself) & the satay stalls are open for business. Great stay. Free Minibar was a nice touch, also the rooms were clean and bed was comfortable. The amenities were useful and the rooftop bar and restaurant are fantastic quality! What an amazing, modern, boutique hotel. Upon arrival I was quickly checked-in and presented with my door key. The room was spacious, modern, hi-tech and very comfortable. I would highly recommend this hotel with their friendly staff. The Xperience forgot to return $30 from the pre-pay deposit on the day that we ate at the hotel. Then I sent out 2 emails to the hotel to ask them to clarify about the issue and after two hours later, still no reply. I had to go down to the hotel to ask them in person. The hotel was very careless and unprofessional. But the food we ate was good. Great stay and service, let down by the cleanliness. Had a great stay and really appreciated the attentive service. I did notice under the bed was very dusty and my bathrobe had makeup stains on it. Staffs are helpful with lots of smile unlike other hotels. Room is Ok and good for value. Excellent room , beautiful decoration, very spacious and friendly staff. The location is also great . Numerous restaurant around very close to the hotel. The swimming pool on roof top is small but very pleasant.